Big, beautiful, and bold. Boarding at the Atrium, the ship was rocking & rolling with up-tempo music creating a typical Carnival party hearty atmosphere. The main pool was already well utilized with guests soaking up the rays with the live steel drums maintaining the party atmosphere. The casino is huge. Entertainment options abound on this ship and even the most hyperactive among us would be challenged to hit all of them in a 7-night itinerary. Water park, IMAX theater, ropes course, sky ride elevated bikes – Havana Lounge, Red Frog, Blue Iguana – production shows, comedians … the list just goes on. While activity options abound at every turn, my exploration uncovered plenty of areas where guests seeking a quieter, gentler cruise experience could relax in peace and comfort. Grab a good book and head toward the adults-only Serenity enclave … I also found the aft pool area to be peaceful and almost totally deserted during my tour. Vista is currently sailing 6- and 8-night itineraries from Miami. This would be a perfect ship for families, for multi-generational groups traveling together, for any cruisers who prefer a high energy cruise environment with an array of activity and entertainment options. She will move to the Port of Galveston later next fall. 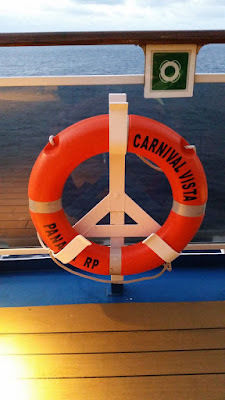 PROS: Loved the food, one of the best meals I’ve eaten on any ship anywhere; Havana Lounge; Kid’s program second to none; the prevalence of outdoor areas where a cruiser can connect with the ocean. CONS: Not much of a fan of the ship’s atrium area which seemed rather cramped to me and excessively loud; casino area had definite lingering odor of cigarette smoke; and I really did miss the white tablecloths in the formal dining room. Classy, understat ed, elegant. Holland’s new ship may be the largest in their fleet, but it remains a mid-sized ship with an upscale, intimate atmosphere. HAL has moved to add touches of contemporary flare to their fleet, but they (thankfully!) still very much adhere to their traditional roots. No climbing walls or water parks on these ships where instead you can enjoy an afternoon high tea, a wine tasting event, or perhaps a hands-on cooking class led by a well-known chef. Entertainment still abounds onboard … though far less “in your face” than zip lines and belly flop contests. Music is a resounding theme onboard Koningsdam. B.B. King’s Blues Club offers classic blues as well as pop favorites. Lincoln Center features outstanding classical presentations, while Billboard On Board features what you might expect – billboard classics. And yes, there is a good-sized casino onboard as well. Koningsdam could be a clear choice for cruisers who appreciate a mid-size vessel featuring fine dining, exceptional wines, beers and whiskeys, and enrichment programs over frenetic activity. It is also a fine ship for families who prefer a more subdued family atmosphere. The ship has great kid’s programming and a variety of oceanview and interior staterooms designed specifically for families. Many accommodate as many as five passengers that offer split bathrooms that could have been taken straight from Disney’s playbook. PROS: Great food, varied enrichment options and intuitive service on intimate mid-size ships. Elegant and refined shipboard experience – without a hint of stuffy. I didn’t detect even the slightest hint of smoke in their casino. CONS: I found the suites I inspected to be surprisingly small, even cramped – though the bathrooms were large and beautifully appointed. Very much a contrast with some of the expansive suite spaces found even on Royal Caribbean and Norwegian. 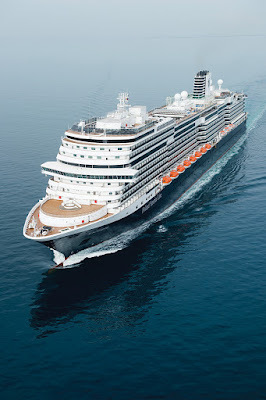 SO – Vista or Koningsdam – which brand of cruiser are you? These days there truly is a ship and cruise style for almost any traveler. We are available to help you sort through the lines, ships and itineraries to best suit your travel style, preferences and budget. Contact us today … we welcome your questions.